Former Iraqi Prime Minister Nouri al-Maliki has called for a region-wide “military resistance” in order to retake Syria’s Golan Heights from Israel. US President Donald Trump recently recognised Israeli sovereignty over this Syrian territory, in defiance of the United Nations and most world states. Al-Maliki, who continues to enjoy considerable influence on Iraq’s political scene, also said that if Israel were to launch a new war on Lebanon, Iran, or any other Arab or Muslim state, then the whole region ought to intervene in that conflict against Tel Aviv. – Maliki: In fact this is not the first event caused by the Trump administration in this period, which has shaken the international human conscience. From his recognition of al-Quds (Jerusalem) as the capital of Israel and his transfer of the American embassy to al-Quds, he then went on to fully recognise Israeli sovereignty over the Golan (Heights), striking with this all international resolutions and human principles, and the atmosphere which arose from the (work of) the United Nations. The danger of this in fact, is not that the Golan (Heights) is now under Israeli sovereignty – the Golan (Heights) will never be under Israeli sovereignty. This is an open battle between us and the Zionist entity that does not (simply) end with Trump’s recognition. And hence even the global reaction to Trump’s decision was stern, from the EU, the UN, and all world states, no one accepts that this issue is open for bargaining as President Trump has done. What is in fact more dangerous than this is the moral and human dimension, that you give away the land of an oppressed people to an usurping entity, where are (your) human rights, freedoms, where is America when it comes to all these slogans that it would (repeat), where is the international order – with America being the greatest power that is supposedly sponsoring (this order) – where are all these sayings of America? For this reason, what we can gather from these actions and what may come thereafter, in terms of this crumbling before the Israeli will by the Trump administration, we fear that it may bring forth things other than this, that it may encourage Israel to carry out further adventures, military adventures, on top of the political adventures and infiltrations of Arab and Muslim societies. Thus when we are before such a phenomenon, in the form of what the (US) administration and Israel are carrying out, and the extent to which some states have reached, who are racing towards normalisation of ties with Israel, that means that we are before a great challenge as a nation. How do we face this challenge? We face it through resistance, and I mean armed resistance, if the issue demands this, just as what is occurring to Gaza, and to Lebanon, Syria, Iraq, Iran, and to Yemen, armed resistance (against) those who wish to violate the will of the Ummah and its sovereignty, there must be resistance (against them). – Host: Are you calling for a war against the (Israeli) entity? – Host: But you said military (resistance). – Maliki: Even military (resistance), I call for resistance in all its forms, if it requires military resistance then so be it. And if it demands cultural (resistance) then so be it. If it demands economic (resistance) then so be it. – Host: (Resistance) by the states which you just named? – Maliki: By all states, and peoples as well, and civil society organisations, all must be ready for comprehensive resistance, and to reject the decisions of the American side. By nurturing the Ummah, nurturing the Arab and Muslim peoples with the spirit of rejection, resistance, steadfastness and tenacity in the face of Israeli plans. – Host: Today if something occurs and the situation escalates – you have called for military resistance – let’s say things escalate and a war breaks out between perhaps Gaza or Syria, and the Zionist entity, do you call for a Lebanese-Iraqi-Yemeni intervention for example, and even an Iranian (intervention), to enter into this conflict? 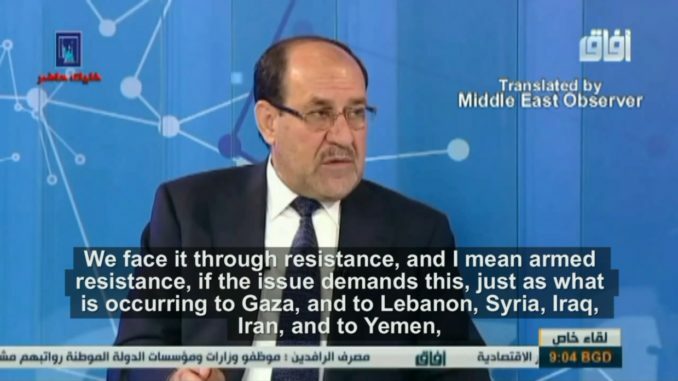 – Maliki: If Israel declares war against the Ummah (nation), against it states, peoples, if (Israel) does indeed enter a war against Lebanon or Hezbollah, or it enters into a war with Iran, or it enters into a war with Iraq or with any other Arab state, then yes I call on the necessity of the Ummah to be present, stand firmly, and to resist this Israeli aggression against any portion of the geography of the Islamic world. – Host: (Israel) today is taking over land, this looks like war and aggression, does it not? – Maliki: Yes, the war that we mean is real military warfare, where there is the launching of missiles and warplanes and destruction e.t.c, as for what is occurring today in terms of (declaring sovereignty) over land, yes, this is another form of war, exploiting the circumstances which the Ummah is passing by, the exploitation of the circumstances which Arab states are passing by, and these political tremors and troubles, Israel has begun to negatively exploit these circumstances, it carries out (policies) and builds settlements, and even America found that there is no strong will on the part of Arab and Islamic states, with the exception Iran and some other states who took a strong stance. Iraq also took a strong stance, other states as well, like Algeria – there are states who are still committed to the principle of rejection, resistance, and refusing to surrender. However, if America does not find a rejection that is stronger than (simply) surrendering (to its will), then it will take other steps. – Host: There is a similarity in the perspectives that you presented and that of Sayyed Nasrallah in his speech regarding the Golan (Heights), is there coordination going on regarding this issue? – Maliki: No, in actual fact, all those who care about the Ummah, the region, Palestine and al-Quds, (they all) speak the same language.